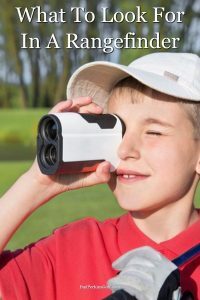 Among the many techy gadgets now available to even the average club golfer are rangefinders. Although more simple to use than some other gadgets such as swing analyzers, you still need to know what to look for when picking one. So just how do you go about choosing a golf rangefinder? Although an obvious point, there’s no use shelling out your hard-earned cash on a rangefinder that’s inaccurate. With today’s modern technology, even the less expensive rangefinders are pretty accurate, certainly more so than your eyesight. Despite this, accuracy is still the number one most important thing to consider. You don’t necessarily need the rangefinder with the longest range. After all, what’s the point of having one that’s accurate to 800 yards if your longest drive is 300 yards? Even if you could hit the ball that far, it’s not likely the rangefinder will have sufficient magnification to see the target anyway. So you simply need to look for a rangefinder that offers a sufficient range for how far you actually hit the ball. Buying a rangefinder with a longer range is pointless if the magnification doesn’t let you see the target anyway. So you need one with sufficient magnification. We recommend at least 5x magnification. There’s not much point having a rangefinder in your bag if the battery’s dead when you come to use it. So you’ll need one with a battery life that’s long enough to easily last a full round of golf, and preferably at least two full rounds. Luckily, due to modern battery technology this isn’t so much of an issue. As we mentioned at the start of the article, rangefinders are easier to use than some other more complicated golf gadgets. That said, you still want it to be as easy to use as possible because you don’t want to slow your game, and that of others, down. It should just be a case of taking the rangefinder, selecting the target and pressing a button. The distance reading should then be virtually instantaneous. You can spend anything from $100 to about $400 on a rangefinder. You’ll want to choose the best one that your budget allows. Ideally your rangefinder will be waterproof, or at the very least water-resistant. You want to be able to use it in the rain, and you don’t want it to break if you drop it in a puddle or something. Similar to above, you want a robust and well-built rangefinder that can withstand being dropped on hard ground. When you’re spending so much money on a gadget you want one that will last. You don’t want to have to be replacing it within a year. This is only a minor factor, unless you’re someone who’s extremely conscious of appearance, but the appearance of the rangefinder can be the deciding factor if your research leaves you unable to choose between two models. Many of the top rangefinders come with extra features that can be very useful. These include things such as pin-seeking technology. This allows you to lock on to the flag pin rather than the tree next to the green, for example. Slope calibration is another feature you’ll find on the better, more expensive models. This allows you to compensate for whether or not your shot is uphill or downhill. Some of the rangefinders also include protective cases which provide an additional layer of protection from accidental damage. Golfing technology has come on in leaps and bounds and with that has come an increase in choice when it comes to gadgets. Keep in mind the advice in this article when choosing a golf rangefinder and you’re sure to make a wise choice.